I tend to approach every composition project as if it is a completely new endeavour. I don’t believe that I have a style of composition (although some people have said that I do), and this often worries me. Should I have a sound? Does this mean that I have in some way failed as a composer if people don’t listen to any one of my pieces and immediately exclaim “That has to be a piece by Marc Balbirnie” … assuming they somehow knew me already. To be honest I haven’t come to any conclusions on this question, only that a composition should be true to the composer and maybe capture some essence of them in that moment. I have been told before that this is a romantic notion which should perhaps be left behind with the romantic period itself. I find this rather unfair and hard to stomach as a concept – to believe that self expression (or rather the expression of oneself) is in someway irrelevant or separate to the creative process. How is it that individualism and emotion are in conflict with modern compositional techniques? Traditional diatonic harmony is not the only means of emotional expression. However, this is all beside the point, and yet exemplifies some of the questions that a modern composer may pose to themselves before engaging in a new work. At a fundamental level there are really only two things that a composer must deal with when writing a new piece – an awareness of the technical and idiomatic writing for the instrument(s) in question, and their own choice of musical language, whether it is automatic or specific to the piece itself. Trying to create a synergy between these two areas can be daunting at times. The easy solution is to write idiomatically for the instrument(s), but in some ways this could be seen as cheating. It can be more challenging for both the composer and the performer if the piece does not conform to the usual idiomatic approach. I want to clarify that by non-idiomatic I am not suggesting the partial or complete use of extended techniques, or using the musical instrument for a function other than that it was intended for; i.e. 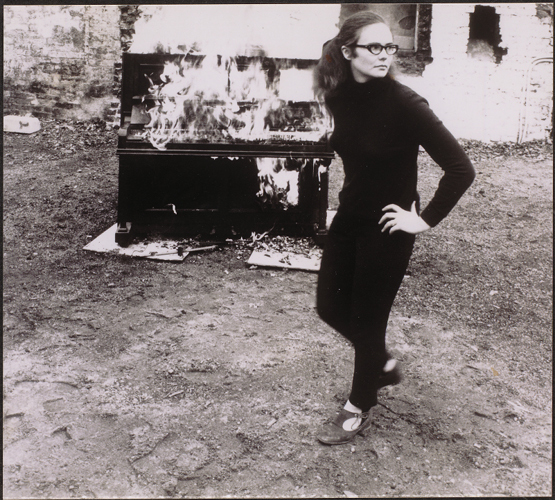 burning a piano as in Annea Lockwood’s Piano Transplants. Not that I have any aesthetic or philosophical issues with these approaches. Extended techniques have been nearly completely explored and exhausted for all existing instruments – can they really still be regarded as being extended techniques? For the latter, I would describe the burning of a piano and subsequent recordings as being more of a spectacle or performance art, and sonically they could be described as electro-acoustic – but not as an acoustic composition, as the only musical performance score direction is ‘Play whatever pleases you for as long as you can’. Is this enough to be regarded as a score? Is intent or concept enough to define a work as being a musical composition? 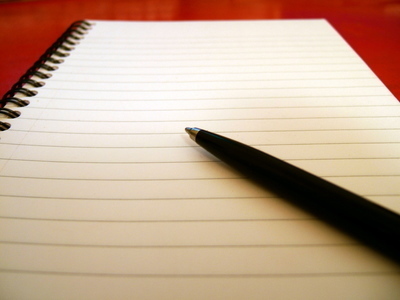 If so, can I merely hand a blank page to a performer and not say anything. Whatever they do, whether they play or not, is what I intended. Their actions for a period of time are in some way loosely defined by me (or at the very least in response to me), and are therefore proof of composition. Is this what it all boils down to at the end of the day? Obtaining the focus of an audience? My first approach to writing for the marimba could be described as wanton naivety. 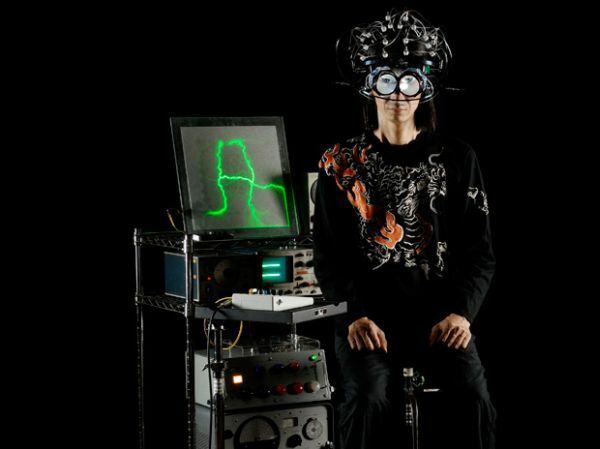 There are several classes of instruments; wind – a performer blows through a tube of some description and either the vibrations of a membrane at the mouthpiece are amplified or a column of air is vibrated, string – a performer causes a string to vibrate through a single attack or continuous friction, and percussion – a performer or mechanical device hits something and the object itself vibrates in some way. The last category is probably the most misleading in its apparent simplicity. It covers a huge range of different instruments – some pitched and some unpitched, some with keyboards and many without. The marimba is a pitched keyboard percussion instrument of African origin, although its current chromatic form was developed in Guatemala, where it is the national instrument. It is very similar in design to a xylophone, which is made of varying sized wooden laths. The larger the lath is the lower the resonant frequency when struck, and hence the perceived pitch of it. Therefore the laths decrease in size from left to right (from the performer’s perspective) as the pitch increases across the keyboard. As the xylophone is a percussion instrument the energy of the notes come from the initial contact made between beater and key, which tends to dissipate over a relatively short space of time; i.e. 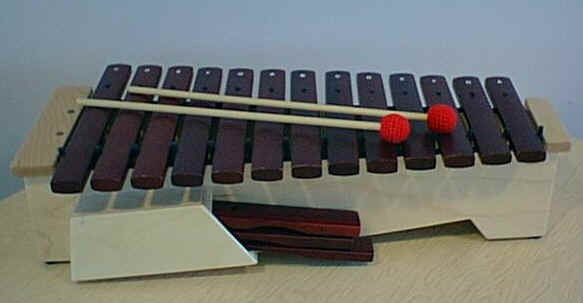 the xylophone has very little capacity to sustain notes. However, the marimba has resonating chambers which hang below each of the laths so as to allow the notes to resonate longer. This is particularly noticeable in the lower range of the instrument. This means that notes can ring out for a short period, but cannot be sustained for a predefined amount of time unless the same note is continuously struck by the performer. The next notable point about the instrument is the sheer size of it. This is easy to overlook as a composer sitting at a desk, often looking at a computer screen or playing a MIDI keyboard or guitar. 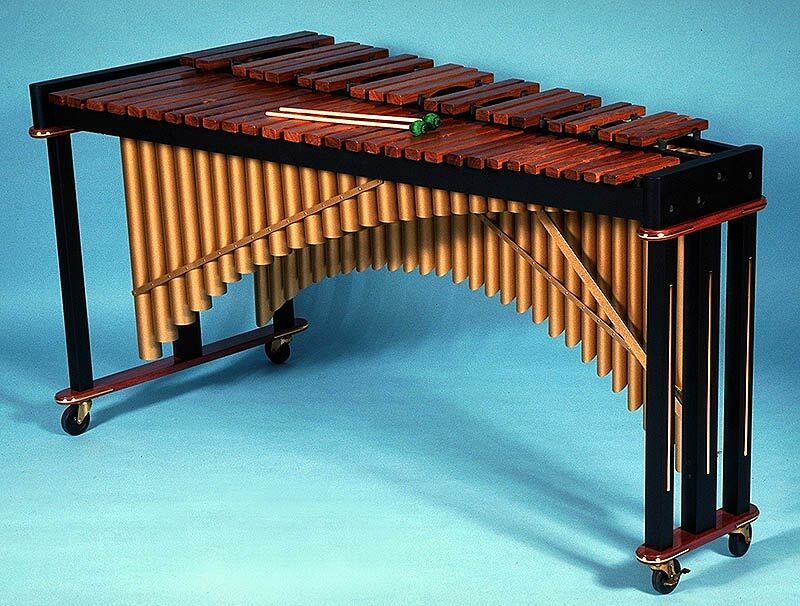 The marimba is no ordinary keyboard instrument, nor is it just another percussion instrument. The sheer size of the instrument (approximately 2 metres long, but varying, depending on range and register) presents practical problems and limitations for the performer, and therefore composer. For example, it is not realistic to ask a performer to play continuous and simultaneous melodic parts at the extremities of the instrument. The reason for this is simple when you think about it – the performer cannot see both of their hands at the same time and so cannot be sure of accuracy … and then there is trying to read the score to consider as well. 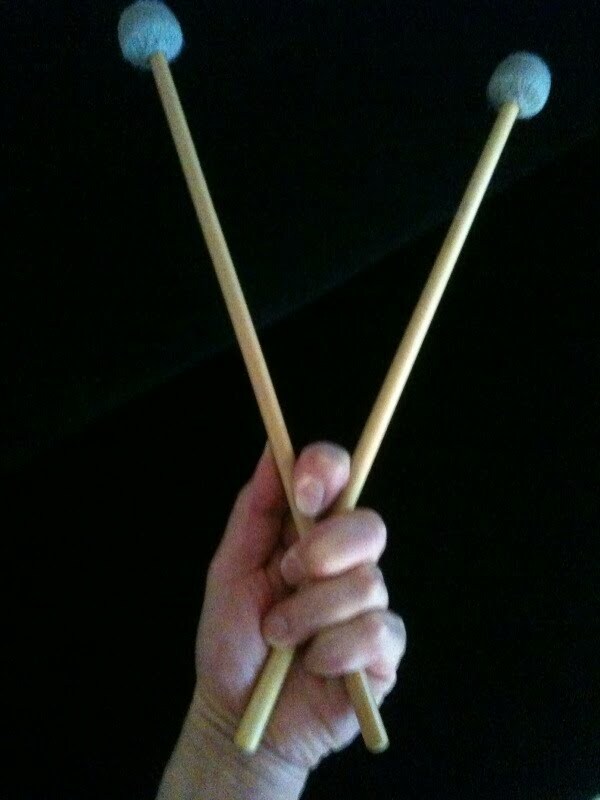 In addition, the performer can use up to two mallets or sticks per hand whereas a pianist can use all five fingers on each hand independently. It is possible to play intervals with one hand on the marimba, but some intervals are trickier to play than others as the key spacing is different depending on the register being played. Some of the restrictions of the instrument are apparent and obvious, whilst others are not. When faced with these challenges as a composer the greatest asset to be deployed is that of the knowledge and skill of the performer themselves. No one knows the instrument better than the performer, and Alex Petcu was most gracious with his support and patience when it came to ironing out the performance problems with Contour (infinite variant). The most difficult challenge of composing this piece was trying to marry the conceptual aspect of the piece with the practicalities and technical aspects of the instrument it was being written for. The idea for this piece initially came from the impending deadline, but after much consideration it became a lot more than that. What if the computer wrote the piece for me? What would this mean and how would I go about it? The piece was composed in two processes. The first was by ‘performing’ a generative MIDI software patch written by the composer. This patch had controls for tonal palette, number of voices, voice register and range, note rate and note to rest ratio. This provided the raw material for the piece. The second process was to manually edit this material to provide more dynamic and musical expression to the piece. The purpose for using the computer generative algorithm was so that there would be as little melodic repetition as possible. This type of random or complex variation is very difficult to achieve as a human being as we always tend to drift towards repetition of patterns or complete dissolution of pattern – this process falls somewhere in between and so the piece could therefore be seen not just as algorithmic or generative, but as a cyborgian composition. Contour (infinite variant) for solo marimba will be performed by Alex Petcu, percussion and director of the Cork New Music Ensemble, at the June 2012 ICC concert in the Kevin Barry room of the National Concert Hall. Tickets can be purchased online from the NCH booking office. The score for Contour (infinite variant) can be downloaded from the following link Contour (infinite variant). Posted on June 20, 2012, in Academic and tagged alex petcu, algorithm, composition, generative, icc, irish composers collective, marc balbirnie, marimba, national concert hall, nch, percussion, xylophone. Bookmark the permalink. Leave a comment.